Here are six prayers that you can send to a prisoner or someone who’s in prison now can use. 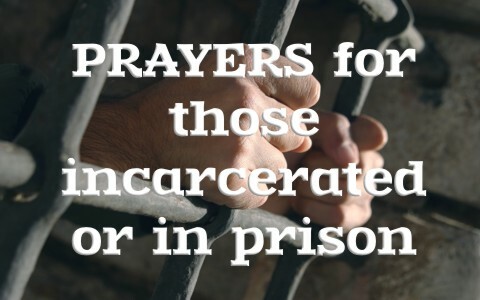 Father, we pray for those who are incarcerated, but we also pray for their families that they would receive the care and attention they need, and have their physical, emotional, and spiritual needs met by other family members, friends, church members, or someone else. Please Lord, allow them to keep their hope alive that a family member behind bars is still not forsaken or forgotten by God if they have trusted in Christ; if not, we pray for them to know Your Son, Jesus Christ. May the families find comfort from others who are in similar situations and that they would be praying for one another. Oh Righteous Father of Mercy, I pray for these men and women who are cut off from their families and who are serving time behind bars. As you know, it is very hard being separated from loved ones. I pray these inmates may be able to see themselves as you see them, and that they are a child of theirs and are co-heirs with Christ, just as much as those who are out in the world. We know, if they never get out, we will all meet together someday at the great wedding feast of the Lamb of God. If they are able to be released, please shield them from the judgment of others because they have already paid their debt to society, and they are now free. They shouldn’t be referred to as a criminal, con, or anything but a child of God…just like we are. Many of these men and women face that double jeopardy every day of their life after prison, so help others see them as forgiven and cleansed, and a child of God, and treated with respect and not treated as if they’re still guilty. I pray this in the name that is above all names, the Lord Jesus Christ, amen. Father God, I pray for those prisoners who are behind bars and that You give those who’ve trusted in You, peace. Please help them to know that You are sovereign over all things and that much good can come from bad (Gen 50:20; John 3:16), and in even these men and women’s darkest hours, You are their true source of light which is found in Jesus Christ. I pray that you give them the peace that Your Word promises for those who believe in Your Son (Rom 5:1) and please help them to know they are no longer condemned (Rom 8:1). With the comfort that You give us, please give to them Lord, so that they might pillow their head tonight in peace, knowing that if you would come tonight, those doors would be open forevermore. I ask this for the glory of the Lord, Jesus Christ, in Whose name I pray, amen. Father God, truly only You know how these men and women feel at this time. We cannot know exactly what they are living through right now. The world seems to be getting more dangerous every day Lord, and maybe for these men and women who might live with that fear. In Your sovereign providence, it pleased You to call out some of these in their darkest hours, and to become new creations in Christ (2nd Cor 5:17); to a new life in Christ. Help see that they can run to You Father, for You are a Rock and a Shield to those Who trust in You. In Your great wisdom God, You sometimes use hard places to soften hearts, and in such darkness, your grace is more amazing. Not many of us are great in the eyes of the world, but You have no respect for persons. You reach out to those who humble themselves Father, so help them submit to You and be set free from their fear by trusting in You. Please Father, protect them on the inside so that they would be able to study Your Word, be a witness to those still sitting in darkness, and submit to authorities which is submitting to God (Rom 13:1-5). God, You alone know the future of these men and women; help them to rest in Your sovereignty. Help them to know they can trust in You. For those who have not trusted in Your Son and received eternal life, please set divine appointments for those who are Christ’s witnesses inside the prisons, and keep them safe from harm while being His voice. May You receive all the glory for these men and women’s lives that’ve trusted in You, and in the mighty name of Jesus Christ I pray, amen. Great God in heaven, thank you for those who have received eternal life in Jesus Christ, and for those who have been born again behind prison bars. Please Father, enable them to see hope that is found only in Jesus Christ. Give them a desire to seek Him, and to long for that eternal home when all of the present, evil and suffering will be history (Rev 21:4). Please send them Your Spirit to point them to Your Word of hope in Your Holy Word, the Bible. Apart from You, and Your Word, we could not know You or Your Son, Jesus Christ, so thank You for granting us Your mercy and giving us Your grace, and for those who You have pardoned, even if the state has not, they are seen as having Jesus’ righteousness (2nd Cor 5:21). Help them to see that You have pardoned them, without parole, and loved them unconditionally. Lord God, allow them to fix their eyes on You, and the hope for a future we can’t even imagine, and that hope is found in Christ, in Whose precious name we pray, amen. Father, we know You can even use evil for good. All we need to do is to look at the cross, so help these men and women who are incarcerated to know that everything in our life, good and bad, is for our ultimate best (Rom 8:28). Sometimes we don’t always understand how bad can be good. Help these prisoners to see that God is not going to give up on them, because Your Word shows that You forgive their sins and cleanse them from all unrighteousness. If these prisoners are able to see that You are still working in their life Lord, they might have hope and know that You have promised to never leave them or forsake them (Deut 31:6; Heb13:5), even when they or we forsake You. Help them to take You at Your Word, and not use their feelings to guide their beliefs. Perhaps You can use others to help them inside the prison Lord, for nothing is too hard for You. Allow them to see the good that can come from where they’re at now, and even if it looks bleak, good will come from it, and in Jesus’ strong name I pray, amen. Great God in Heaven, You alone determine the future and know that which is not yet, so help these men and women to see that You have a purpose for where they are now, and know that You can use anyone for Your glory and for Your purposes, including them. We know that You have commissioned us to make disciples of all nations, and that includes those who are incarcerated. Father, may You use these Christians behind bars to bring others into the kingdom by pointing others to Jesus Christ and trusting Him. They realize that You have allowed them to suffer the consequences for their own actions, yet I realize You may use them to reach others behind bars where we cannot, so please Father, make divine appointments for these Christians in prison, and allow them to cross paths with those whose heart You have prepared for the Word, and in the Holy Name of Jesus Christ I pray, amen. The Bible teaches us that Jesus expects His church to visit those who are in prison. He said, “I was in prison and you came to me” (Matt 25:36), and this is how He sees it; “as you did it to one of the least of these my brothers, you did it to me” (Matt 25:40), but we can’t forget about these inmates families either. They need ministering too. If we minister to prisoners and their families, we do it for Jesus, but more importantly, what you do for the inmate’s families, you have done to the inmates. Ministering to prisoners is needed, but so is ministering to the families. They too are in a hard place, mentally, emotionally, and probably financially. Plus, they often live under “guilt by association,” unfair as that is, so they need all of the care and compassion they can get. Please pray for my son he is in prison and scared he is going to get a beating.God bless you all. My son. Has tourttes syndrome he is in prison please pray for Jesus Christ to be with him .and to take care of him .he is afraid the guard are Going to hurt him because of his involuntary movements caused by Tourttes syndrome and something else please thank you and God. I will pray about this Shaune. I am so sorry. Pray that your father puts his trust in Christ if he has not done so already. Hi Jack wellman i would like to talk to you i have two family members that are going through what you have allready experienced. I can try to help you. There are many Christian prison ministries around the country. Whatever I can do, I will do. Please pray for Rolando Ruiz Jr, who’s been on death row for over 20 years. Now he faces execution today March 7, 2017 in Texas. I ask for prayers for him and his family. Yes, prayers for all concerned. Thank you my friend. my son in law is looking at 25 years to life in prison for bank robbery with a gun one of the customers attacked him and was shot in the arm and leg. He has a 7 yr. old son who is going through a hard time as well I am to. I know that he would never have done this but he has a drug problem (heroin) and now this has come up against him his history isn’t good and he might not ever come home the time he’s looking at I won’t be alive if he ever gets out this is heartbreaking to know that he’s locked away from us. I am in a legal battle unjustly with a landlord. Please help me pray for God to send his angels of protection to fight my battles in court against and win the war against my enemies this I pray in Jesus name the more prayers go up, blessings come down. Amen! Amen…I wished you were near us as we have a lady willing to join our church and will even relocate to our city if she can be part of the evangelism we do, so I will pray for you about this and thank you for the encouragement and I thank God for you that there are others who are for the lost like you. I am from Philippines. I guess you know what is going on with my country with regards to drugs. Our President did’nt know what he is doing and that of his policemen. My husband is in jail for 8 months now. The policemen planted drugs on him and his colleagues. I admit my husband is a user. But he should not be in jail and treated like a criminal. He is just a user. Please pray for my husband to stay away from any sin. Please pray that his Petition for Bail be approved and soon he gets out of jail. We really missed my husband. We have 2 kids. I am working all alone because he’s taking care of the kids while I am at work and he take’s care of house chores. But I am alone now doing everything. God please help me. Please call your pastor. We are praying for you. Talk with your pastor as sometimes churches have funds from Deacon Funds. You are not alone as God says He will never forsake or leave you (Heb 13:5) so you are not alone, according to the Bible and you have your church family too. Please pray for my husband Bill Ballard of 30 years who is in jail in Nodaway County Jail in Maryville Missouri. Pray God uses this time to get his attention. He is a Christian but struggles with bi polar. Please pray for my husband who could be facing a possible max of 10 or 20 yrs in prison if not reinstated on parole, pray for my son who is currently serving a 3 yr sentence in prison, and also pray for my daughter who will be leaving the states this month to work for our Lord doing missionary work for the next two years. Thank you & God bless. Thank you these prayers have blessed me this morning. I have a 27 year old son who has already done 10 years from the age of 15 to 25 and was out on parole with five years on shelf. He would have gotten off of probation in 2018 unfortunately drug addiction mental health issues and a really tent home environment he now has charges pending for armed robbery he was shot but he recovered he has probation violations and has to answer to 3 jurisdictions Florida Ohio and Kentucky which happens to be a commonwealth state all type of fears have plaka me but I know that I have to continue to pray he has cut off all communication and I pray that he does not give up and he will see and be able to be a part of his son’s life and who is due December 7th please pray with me and I come into agreement with your prayers and my biggest prayer is to keep him protected by the Godand safe and that he will be able to be a part of his son’s life there were so many arguments in our household I tried to do my best but God delivered me from addiction many many years ago and generational curses are broken I pray for mercy in favor thank you so much for this article. Praying now Mrs. Ratliff. I am so very sorry or your great loss. I will be praying and am doing so right now for you and for Trista that she might be saved. Please pray for my son Rick Lawson he is in prison in Mississippi he has been locked up for 7 years I am trying to get him a parole date but I don’t have the money for an attorney please pray for my son and that I can find a lawyer to help me get him a parole date so he can come home. Please pray for my Son Samuel (25) he has been in and out of jail and rehab, All his offense have to do with being an alcoholic and for violating parole, he can’t help himself any more, he needs JESUS. He’s had great jobs then loses them, he’s been married and has a beautiful son he doesn’t see anymore. Please, please he needs prayers. Thank You. I will pray for your son Brenda. I am sorry you have to go thru this and so does your son. Praying…perhaps you can ask your church to pray for him too as we need one another more and more as the day of Jesus return nears (Heb 10:24-25). Please pray for my hubsand he is incarcerated and they have him and his cell mates in the SHU because one of his cell mates had difficulties breathing in his sleep and passed away i pray that they release them back to there cells so he can get visits, emails and he can call! My hubsand cant seem to get a break and be does everything he needs to do and abides by rules and is a very humble man i just pray for his early release in Feb 2018 thank you so much we just been dealing with alot lord knows we have! Please pray for my son in prison. Pray that God intervenes so he can get to a program that will allow him to transfer to a better camp. I also pray for God to release him soon. Thanks. Please pray for me and my husband for he is in prison with a crime he does not remember doing my husband suffers from schizophrenia, bipolar disorder, ptsd and paranoia. He was under the influence of his medicine and alcohol. He was hearing voices my husband is an amazing man feed every one cares for all . Love helping animals and people in need. Just has his wars with demons. Please in Jesus name amen thank you. His name is Carlos Perez. My name is janitza. We have four children and I suffered a miscarriage recently do to his incarceration and stress. Pray for us . Praying right now Janitza. God is sovereign over this. When we can do no more, only God can do the rest. I am a Guardian ad Litem working with children in foster care. Pray for these children whose parents are incarcerated. In 2015 December, I made contact with a prison Deacon Roy. We prayed over the phone and he encouraged me to pray for the prisoners, one especially who is a dad serving life in prison. This is a whole new experience for me. 3 weeks after meeting Deacon Roy, I learned he passed away on that Christmas Eve. His words stay with me…that Christ worked with and loved the prisoners and that he spent time more with the prisoners because they need Christ more. Deacon Roy told me I may get ‘push back’ from people not understanding my goals but I needed to be strong and carry on my work. Me and my family now visit and write to the young man serving life in prison. He was recently taken off of death row and re-sentenced to life in prison. Prayer works… Believe. Amen Dorothy. Yes, prayer works, and you have mind, particularly for this dad serving life in prison. You are right to do this. Jesus said it’s part of what we do for Him (Matt 25:35-36, 40). Carry on my sister and thank you for serving and praying for those who the world has little or no regard for. Please pray for my son, Daniel, who received a life sentence for a horrible crime that he was a part of but not the main perpetrator. Please pray that his appeal will move quickly. Please pray that while awaiting his appeal he does not give up, and will make the right choices. Please pray that he will hear from his son. Thank you so much! Praying right now, but mostly for this young man to put his trust in Christ. That’s the greatest decision anyone can ever make, but also praying for him to think about his life and begin to make better choices. Please pray for my nephew Marc – he is on remand he hit a man and he died – the trial is May 8 – someone has come forward and said the man who died was hit the day before with a baseball bat but there are no witnesses as yet – but there are many people saying this other attack happened . The man died from a brain bleed . My nephew and his wife are on remand for murder – its such a mess and as a family we did not need this as my dad hasn’t been dead a year and this has put our family into shock – my nephew is devastated he is really remorseful he hit the man who died because he was harassing his wife and he spat in her face – my nephew and his wife just lost a baby in December through IVF 🙁 – our family are really suffering right now . My mother is 85 and she brought my nephew up from six months old – a Christian who I know told me that nobody has sympathy for us as a family and would be better to not to expect friends to support us . The opposite has happened we have had a lot of love and support from friends and family and even my nephew and his wife have a lot of support . There is obviously so much more to this than I can say – I’m sorry for the long post – we could do with some prayers right now . My nephew isn’t saved nor is his wife- but my nephew has experienced God’s love and presence – he also told his son that the day of the attack he saw demons all around him – he needs to get saved and so does his wife and I have already been in deep prayer for them both – please agree with me that they will get saved and that if there was another attack on this man who died that proof will come to the surface and that the postmortem will show this attack . Thank you . Hello Jackie. I am praying right now my friend. I am so sorry for all this heartache. I am praying your nephew and wife are saved, something only God can do (Prov 21:1). After reading all of the comments my situation doesn’t seem as dire but my dear friend lost his best friend last year and struggled very had with his death. He made some mistakes and was charged with DUI and possession of Xanax (which he was not prescribed. He is a single father and has raised his little girl predominantly by himself since she was 6 months old, the mother chose a life of drugs eventually leading to prostitution. October 21st she was murdered. While he was out on bond, he made the decision to drive without a license and was rearrasted. Prior to his past year this man has never been in trouble but he has been through a trying year & he has lost his faith. Despite this God has intervened in many ways and I know he has a plan for him. I just pray that God can reach through his hardened heart and get him to remember that even the worst day walking with the Lord is far better than the greatest day without Him. He has been in for roughly 30 days now and could be released on April 11th however there is a chance he may have to stay in till the 25th which is only another two weeks however he owns a business and I have been helping him with his daughter for the last 5 years and she is with me now. I have 4 boys of my own and God has ALWAYS been faithful to us. I know that his poor choices led him here but I also know God doesn’t want someone lose everything especially when their faith is shaken. Please can you pray that God reaches his heart and if it’s his will to please let him out on the 11th. His daughter needs him and no matter what he has done, I know she is innocent and I pray that for her sake God will allow her daddy to come home. I will join in prayers with you Shelly over this heartbreaking situation. Praying now Milreace and praying others will join with me. Please pray for my friend, Kieran. He is in prison and has many addictions. Thank you and God bless you. Hello Allee. Praying now my friend for Kieran. Please pray for my nephew Derrick. He is currently in prison. His release date is late 2021 or early 2022. He’s in for assault and was a substance abuser which I know led to his bad decisions. He’s a kind and helpful young man. He’s been locked up since 2015 and received many awards for completing programs for anger management and workmanship. He’s currently having problems with other inmates and getting into trouble. His guidance counselor said that can lead him into doing the max and getting out in 2024. Please help me pray that my nephew stay focus and make the right decisions so he can do his time and get out 2022 or less. Please help me pray for God to protect him and keep him safe while he stay focus and positive so that he can do the programs he need and be release at an early date of 2021 or early 2022. He believes in God and I pray that he continue his belief and faith through these challenging times. And please pray for me and my family (especially his grandmother) as we support him through this. Praying now Denise. I am so sorry for all this heartache. Our church ministers to prisoners, so perhaps Derrick will use this time to draw closer to God, but most importantly, if he’s not trusted in Christ, these hard circumstances will humble him to do just that. Please pray for my husband, please pray for our Faith to grow more everyday and change our lives. Thank you and God bless you for your work. I have autism and depression. My brother is in prison for murdering our father. We already had strain in our relationship for how he treated me when I was younger (bullying, lying about me). Now I’m not sure what to do. Even thinking about contacting him stresses me significantly, but I don’t want to fail Christ either. I have looked for information on coping, but nothing I have found is for family members of offenders convicted for crimes against other family. I feel a little lost. I am so sorry for this terrible pain Cub, but Jesus Himself says come to Me all who are heavy laden or burdened and He will give you rest (Matt 11:28-30). That is my prayer for you Cub. Our small church has a prison ministry and there are often support groups that deal with things like this, but I am sorry there is nothing there. Please call your pastor and tell him and ask your church to pray for you as we are commanded to do (James 5:14) as we need one another (Heb 10:24-25) and seek to do what Jesus commands us to do (Matt 25:34-39) as we do it to Him (Matt 25:40) or we do nothing for Him (Matt 25:41- and that’s not good (Matt 7:21-23), and as you said, you don’t want to fail Christ. Thank you for these prayers Pastor Wellman. Please pray for my husband rickey harvey who is in prison is california. He was beaten by officers and filed a complaint and it is being used against him. They have now found him ineligible for parole due to this, no one will help. We need you now lord, holy spirit interced on his behavior. Give him your mercy and grace, our children need him and I his wife need him. Please help us, to not give up faith or hope but to remember you are in control. We cry out to you lord begging for forgiveness. Lord please send help our way in the natural and in the supernatural release him in this season. In jesus name amen. I will pray for your husband Mrs. Harvey. God has many times saved those who are incarcerated, and often it is hard to be there (as I once was), so prayers for him and the Spirit to help him and you all through this very difficult time. Please pray for my son Cory Wallace in prison and our family he received 72 years in his part of the death of my grandson. It is destroying our family and tearing us apart. It is devastating as a mother to watch. Praying now Mrs. Hitchens. I cannot imagine the pain you are going thru. I am so sorry. I know many are saved behind prison walls, and that is my prayer for your son. Mrs. Hitchens. Our church will also be praying for you. I’m asking for Prayer for my husband in HighDesertStatePrison he was just jumped!! He’s fighting life and we’re hoping that one day soon God will see fit and bring him home to us!! He has given his life over to Christ Jesus and I’m not sure why he was jumped!! My prayer request that God move him closer! To me that his life is spared!! I’d like to ask that you pray for the safety of my son, Cypress, who is in prison right now. Also, that he sees how to change his ways & we learn to live how God wants us to. I’d also like to ask for prayers for a friend Shane, who’s possibly facing 40 years. And my friend Angelique, possibly facing life! Thank you so much! Please pray for my son who is serving a life sentence. He reads his bible daily and has joined bible study groups off and on, but is not comfortable being around other prisoners. His father and I visit him regularly, but his crime has torn our family apart. As his mother, my heart just hurts. If anyone has recommended verses that he can focus on that would be helpful, please let me know. I pray for the others I have just read about in this thread. Thank you Jack Wellman for giving us a forum to share our burden. Hello Sue. I am so sorry for this hearbreak for you. My prayer is for you and your son. Many men and women are saved while in prison, so may God use this to draw this son of yours to Jesus Christ that he might be saved. Praying for Adrain Mrs. Rogers. Please Pray for my son Daniel M. He is currently in a county jail awaiting trail, he will likely go to a Federal corrections facility for many years due to prior criminal history. We currently reside im Ks. Thank you Mr. Wellman. My son has found Jesus and attends bible study daily.